Chapter 1. 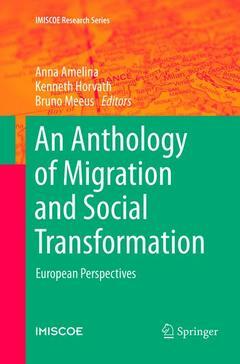 Migration and Social Transformation: Interdisciplinary Insights and European Perspectives: Anna Amelina Kenneth Horvath Bruno Meeus.- Section I: Theorising about Migration and Social Transformation in Europe: Introduction to Section I: Kenneth Horvath and Bruno Meeus.- Chapter 2. Understanding Global Migration: A Social Transformation Perspective: Stephen Castles.- Chapter 3. Theorizing About Change: The Promise of Comparative Political Economy for Migration Studies: Georg Menz.- Chapter 4. Turning to Grand Theory: Cultural Political Economy and the Regulation of Immigration: Nicolas Van Puymbroeck.- Chapter 5. Reflecting on Spatiality in European Migration Research: From Methodological Nationalism to Space-Sensitive Observations of Social Transformations: Elisabeth Scheibelhofer.- Chapter 6. Migration and Postsocialism: A Relational Geography Approach: Bruno Meeus.- Section II: Transformations in the Political Regulation of Migration: Introduction to Section II: Kenneth Horvath and Bruno Meeus.- Chapter 7. The Europeanisation of Immigration Policies: Leila Hadj-Abdou.- Chapter 8. New Guest Worker Regimes? : Michael Samers .- Chapter 9. Identity Check: Smart Borders and Migration Management as Touchstones for EU Readiness and EU Belonging: Martin Geiger.- Chapter 10. Border/Control: William Walters.- Chapter 11: Social Transformation, Subjectification, and Labour Migration: Theorizing the Heterogeneity of Migration Flows in the Current Italian Crisis: Gabriele Tomei.- Section III: Complexities of Mobilities: From One-Way Migration to Multiple Patterns: Introduction to Section III: Bruno Meeus and Kenneth Horvath .- Chapter 12. Cross-Border Commuting and Transformational Dynamics in Europe – What is the Link? : Laura Wiesböck, Christoph Reinprecht, Raimund Haindorfer, Roland Verwiebe.- Chapter 13. Portability of Social Protection in the European Union: A Transformation of National Welfare Systems? : Elaine Moriarty, James Wickham, Alicja Bobek and Sally Daly.- Chapter 14. International Retirement Migration: Transforming Societies Through Purchasing Power: Benno Herzog.-Chapter 15.International Students and Cosmopolitanisms: Educational Mobility in a Global Age: Başak Bilecen.- Chapter 16. ‘Good Motherhood’ - a Dilemma for Migrant Women from Eastern Europe: Helma Lutz.- Section IV: Shifting Politics of Belonging: Introduction to Section III: Bruno Meeus and Kenneth Horvath.- Chapter 17. Struggles at the Boundaries of Neoliberal Citizenship. Theorizing Immigrant-led Movements in Contemporary Europe: Federico Oliveri.- Chapter 18. ‘Islamophobism’ as an Ideology in the West: Scapegoating Muslim-Origin Migrants: Ayhan Kaya.- Chapter 19. ‘How Would You React if You Learned That Your Son Was Gay?’Racialised Sexualities and the Production of Migrant Others in Europe: Paul Scheibelhofer.- Chapter 20. Locating Migrant Pathways of Economic Emplacement: Thinking beyond the Ethnic Lens: Nina Glick Schiller and Ayşe Çağlar.- Chapter 21. Mediated Communication and Migration in Europe – A Contribution to the Ongoing Debate: Ricarda Drüeke.- Section V: Outlook for Researching Migration and Social Transformation Beyond Eurocentrism: Chapter 22. The ‘European’ Question: Migration, Race, and Postcoloniality in ‘Europe’: Nicholas De Genova. Links European migration research to the analysis of changing political-economic constellations in Europe. It provides current insights into political regulation of migration, individual practices of migration and mobility, and their embeddedness in the discourses over belonging and rights. Presents the most current empirical research in relation to general societal transformations.